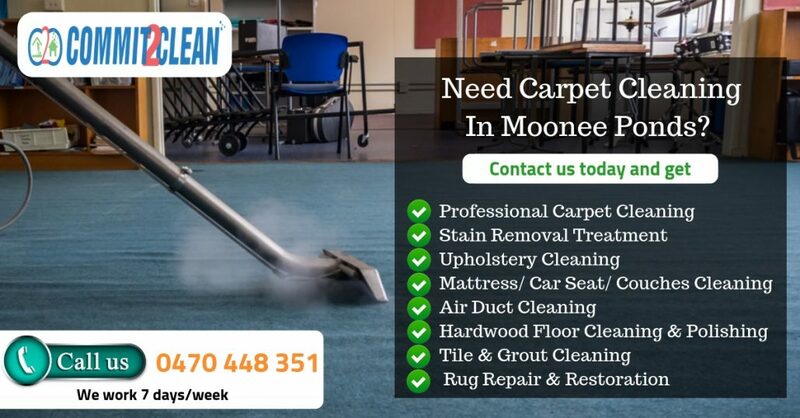 Looking for the best carpet cleaning Moonee Ponds? Get clean you carpet with Commit2clean, We’re the experts when it comes to cleaning carpet, area rug cleaning, spot, stain and odor removal, and we can even handle most carpet repairs. We are STRONG Certified firm which means we have undergone intensive training for dry cleaning carpets and use the industry’s best carpet cleaning equipment and products. What this means to you is quality that’s backed up by a 100% Clean Carpet Guarantee. You can depend on exceptional dry carpet cleaning, repair, upholstery cleaning, oriental and area rug cleaning, fiber and fabric protection, carpet repair and pet stain and odor treatment. Pre-treatment of the carpet area that get high traffic and stubborn stains are usually treated with alkaline solutions. This involves Carpet Pre-Spraying over the entire carpet area and also stain removal treatment, if required. All cleaning methods are only utilised after they ensure they are using the correct products for the correct carpet type. After proper carpet treatment, hot-water extraction technique is used to Professionally steam clean the carpets. With this technique, the carpet gets dry within couple of hours and is ready to use.